Interests - Dog agility, sailing, dancing, golf, loves horses. 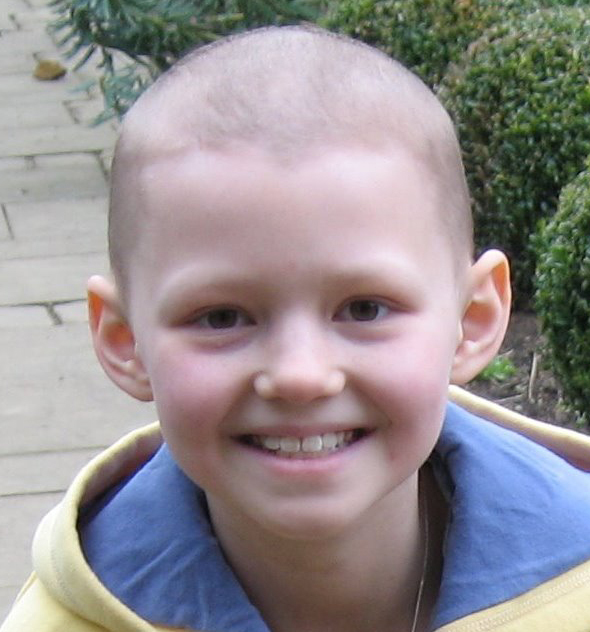 Jemima was diagnosed with Acute Lymphobalstic Leukaemia on 13th June 2007. She had been off colour for a couple of weeks and lacking in energy. We were on May half term holiday when we noticed she was unable to keep up with her sister Emily and couldn’t even walk up a full flight of stairs without sitting down before the top. After half term, she was in a rounders match at school and struggled to complete a full rounder before exhaustion took over. With all of these symptoms, we took Jemima to the GP who prescribed antibiotics for tonsillitis and said to return in a week if she was no better. In this week Jemima did not improve and she also started to develop bruises on her legs and we were becoming more and more worried. We went back to the GP and aired our views whilst trying not to frighten Jemima. Bloods were taken and sent off to the LRI and that evening we received the phone call to go straight to hospital as a matter of urgency. Our worst fears were confirmed the following evening and Jemima began her 2½ year treatment of chemotherapy the next day. Since then, Jemima has been writing her blog so she can keep friends and family up to date. Thank you all so much for all the mail you have sent over the past couple of years. I am finishing treatment very soon and feeling so much better now. I have really enjoyed opening all the cards, letters and gifts you have sent me and so has my sister. I may become a postpal myself very soon too! Thank you very much Kate and also Viks so much for everything over the last couple of years. Mima is progressing through the maintenance stage of her treatment. She has been extremely brave as usual even though she has her leg in half a cast at the moment due to some strain in her ligaments. She is very keen to join in with as much as she can at school and really struggles when her energy levels are not up to it. To compare herself with other girls in her year is very tough as she can’t even keep up when running to lunch! She does have some wonderful friends though who look after her extremely well. Mima has an excellent outlook and tends to be cheery most of the time. Mima says thank you so much to everyone who has written to her and also for the fabulous pressies. She absolutely loves her horse cushion and sleeps with it every night. Mima has been feeling pretty good recently apart from the usual week or so of feeling yuck whilst on steroids. This passes reasonably quickly and she is back to her usual good form. Mima is undergoing a few tests at the moment as she had a funny turn at school last week where she lost about 15 minutes and didn’t know where she was. We think it was probably a little seizure but we are going to see the neurologist and have another MRI scan. When she had a big seizure last year, the MRI showed a lesion on the left side of her brain and the EEG showed some abnormal activity in her brain too so we just want to see what is going on now. Mima is very worried about it all and just wants to carry on as normal a life as possible so we are trying hard to do so! Thank you to everyone who has sent cards and postcards this month. Mima’s face really does light up when her post comes home. She sticks everything to her bedroom walls so she can keep looking at the cards and letters. Mima has had a really good summer without any unscheduled hospital visits. Her hair is growing back beautifully and we are all guessing whether it is going to be curly or straight! She looks extremely well and has managed to join in with most activities over the holidays. School starts again on Wednesday so Mima is really hoping she will be able to go and participate in as ‘normal’ a school life as she can. Mima has really enjoyed receiving all the cards and postcards. They have made her smile and she loves hearing from so many different people. Thank you so much everyone. Mima particularly enjoyed her letter from Percy the dog and she has written back but does not know where to post the letter to? Thank you very much to everyone who has written to her. Mima has been very busy with her summer activities book and made lots of things from it. Thank you also for her lovely cupcake charm, lip balm and stickers. She just loves receiving all this new post. Post Pals is a fantastic idea and the post Mima has received has really lifted her over the past month.